Are you looking for the perfect flooring type that adds a touch of elegance to your office space? You can’t find a better option than commercial carpet. If we compare this flooring option with others, you’ll realize it’s cost-effective and brilliant in many ways. People who love to enjoy a simple and humble office environment will adore this flooring. A great benefit of installing commercial carpet is that you can install it yourself without paying high installation charges to floor service providers. I know how pleasing it is to hear that you can save several hundred dollars by doing something yourself. Commercial carpet installation can change drastically based on the overall area of your office. While it is not a huge cost, it will be great for you to save this money if you're already on a tight budget. For your help, I have compiled a tutorial with simple steps that’ll teach you how to install commercial carpets without any hassle. 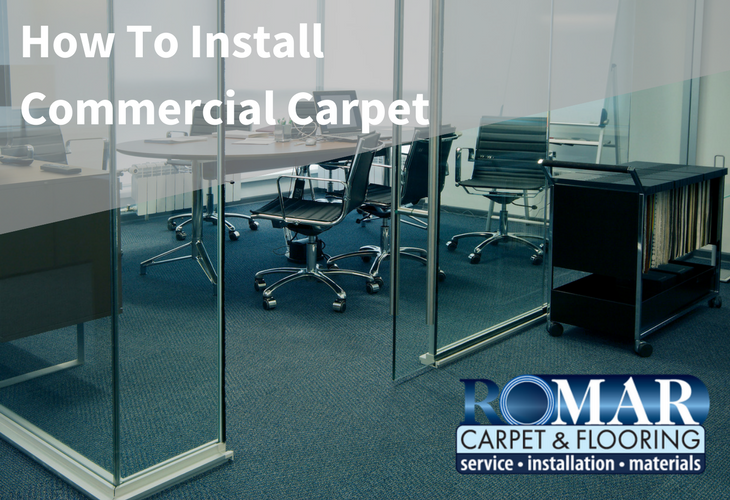 Take a look at the following steps to easily install commercial carpets. Note that it will take you around 20 minutes per square yard to install the pieces of your carpet. Remember to be careful while measuring and cutting to ensure accuracy and avoid making any errors. Each piece of the carpet should be at least four meters wide. You’ll also have to determine the seam point, where you’ll expect the least amount of foot traffic. Align all the pieces so that if there are any patterns, they will match. After finalizing the perfect seam spot, draw a chalk link on the subfloor where the seam ends. With the help of a carpet knife, cut approximately 1 ½ inches from the seam edges of the carpet piece. Use a screwdriver and place the tip of it about one inch from the seam edge. Grind the screwdriver with pressure on the carpet piece and drag it to the entire length. This will create a visible valley on the carpet that looks like a small border. Use the carpet knife or a row cutter to cut through the valley. Be careful not to press too hard or you’ll scratch the subfloor. Position the second piece on the subfloor. The second piece should be placed in a way that it overlaps the first piece by about two inches. In order to maintain the pattern or texture of the carpet, the left edge of the second piece, as it came off the roll, should be in line with the right edge of the first piece. Similar to what you did in the third step, you have to make a valley on the second piece as well. Align the valley with the cut edge of the first piece. After that, cut through the valley with the carpet knife or row cutter. Note: In order to create a straight seam, move the second piece back and forth several times to remove all the gaps before making the final cut. We’re almost there! Fold back the carpet pieces approximately three feet from the seam line. Use a vacuum to remove any dirt or carpet particles left behind during the cutting process. You can also use a heavy object to weigh down the carpet after making the fold so that it doesn’t unfold unexpectedly. With a trowel, apply the carpet adhesive (carpet glue) on to the floor on each side of the seam. After applying it, let the glue sit for a while. After waiting for a while, you can unfold one piece of the carpet. If it’s a large piece, it’s preferable to have a helper or two to assist you in unfolding slowly. You can ask them to hold the corners while you hold the middle. Walk ahead of them to avoid getting any gaps or wrinkles while gluing the carpet. Now, apply the seam sealer on the edge of the seam where you will place the second piece. Note: Be careful not to get any of this glue on top of the carpet, or it’ll leave a stain. After applying the glue under the second piece, unfold it and line it up properly with the first piece. If you can get a seam roller for this step, that’ll be great. If not, you can use a hammer to gently press the seams together to remove any bubbles. If you have more carpet pieces to install, you can repeat all the above-mentioned steps and cover all your floors with your commercial carpet. These steps have been tried and tested, so I can assure you that you can definitely finish installing commercial carpet without hiring any service provider. Did you find these steps useful? Share your experience and shoot your questions in the comments section below.